The awards we received to date have been a cause for celebration and joy for us. Knowing that our work is appreciated and recognized [by other agencies, countries, companies and people], motivates and drives us to continue with what we believe in. 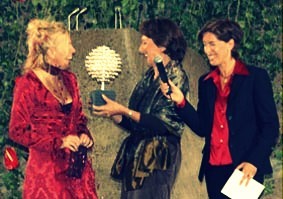 Award for “Best Project of the World” for Sustainable Design within Agenda 21 at EXPO 2000. Hannover, Germany – October 2000. Award for “Best Practices to Change the World” by the Club of Budapest Awards. Frankfurt, Germany – October 2002. Top Award for “Socio-Environmental” by ADVB MG. Belo Horizonte, MG, Brasil –September 2009. Águida Zanol, our president & founder, received the Award for “Best Practices to Change the World”!